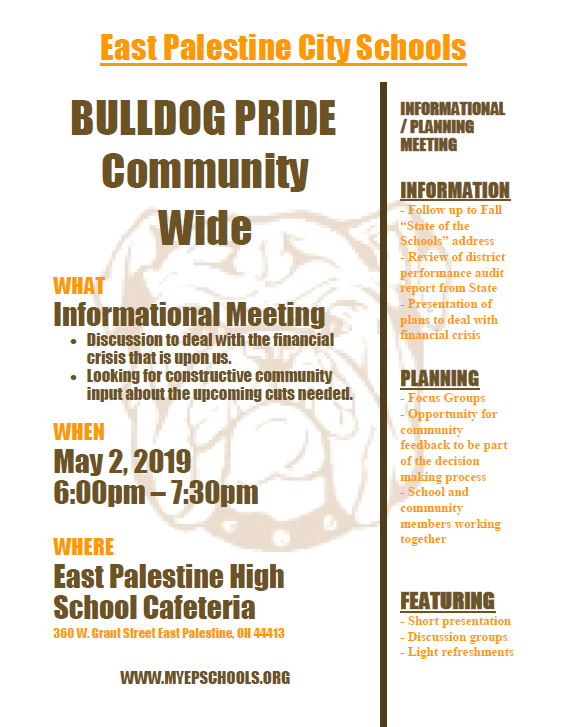 EAST PALESTINE, OH- East Palestine Interim Superintendent of Schools, Chris Neifer and the EPCSD Staff invite the community to attend the Bulldog Pride Community Wide Meeting on May 2, 2019 from 6-7:30PM at the High School Cafeteria. The purpose of this informational meeting to discuss the current financial issues that plague the district. Those in attendance will have an opportunity, in small focus groups, to be a part of discussions that will provide constructive feedback that will help in the decision-making process. YSN’s DJ Yokley sat down with Mr. Neifer to discuss some of the details regarding the meeting.